When I made this, I served it with a side of Fiesta Sides:Mexican Rice. It was a REALLY good combo. The nice thing about this recipe is if you haven’t thought about supper until lunchtime, you can still make it. I only had to cook mine for the 5hr timeframe. 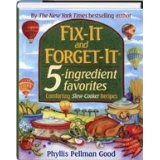 I found this recipe in the book: Fix it And Forget it: 5 Ingredient Favorites. I’ve only got as far as making about 5 recipes from it but so far, I like it! The great thing is, with only 5 ingredients or less, each recipe is usually grocery-budget-friendly! But like with all recipe books, I recommend that you browse through them at the library or bookstore before buying to make sure it’s your style.